Bomb Thrown At Train In Thurles Railway Station. The Constabulary of Ireland, (RIC) was first established back in 1814 by Sir Robert Peel (1788-1850), latter once a Member of Parliament (MP) for the Irish ‘rotten borough’ of Cashel, here in Co. Tipperary; an administrative division that had very few voters yet was represented in Parliament. The Constabulary of Ireland were a trained and disciplined force under the central control of the English governments; which administered its affairs out of Dublin Castle. Members served under a strict code, that governed all aspects of their lives, both on duty and off. They were obliged to display strict impartiality at all times. For this reason, no serving member could be posted to their native district. They held no right to vote in elections or to hold membership of any political or religious grouping. View this short video hereunder, to gain familiarisation of the Thurles area and the persons discussed, before continuing. The Constabulary of Ireland, first had their barracks in Thurles, opposite what Thurles Confraternity Hall, then Thurles Gaol, on Rossa Street, then known as Pudding Lane or Gaol Street. Same was positioned on the opposite side of the street from the Gaol and currently rxisting Court House. The Barracks would later move to the north-east side of Main Street Thurles; today’s Liberty Square, until 1903, (where part of the Ursuline Primary School currently stands today in 2019). After 1903 it moved to Friar Street, to the premises today bearing the name ‘T. Mason’ over the door. It remained there until sometime around 1949, when the present-day Thurles Garda Station came into being on Slievenamon Road. Here within this same Friar Street building, in the past, Sean Hogan and the recently pardoned Harry Gleeson; latter hanged by Albert Pierrepoint in Mountjoy jail in April of 1941; spent some in detention. The former named detainee, Seán Hogan, was a known Irish Republican Army member, and then one of the most wanted men in Ireland, due mainly to his role in the Soloheadbeg ambush. Hogan was arrested on May 12th 1919 by the RIC, having attending a dance near Clonoulty, Co. Tipperary and was held at the Friar Street, Thurles RIC barracks. On May 13th 1919 he was rescued from a train by his comrades, including Dan Breen, while he was under guard by four armed RIC officers. Two of the RIC officers lost their lives and several IRA volunteers, including Breen, were wounded. This rescue, took place on Hogan’s 18th birthday, while the Thurles to Cork train halted briefly at Knocklong railway station in Co. Limerick. RIC officer Thomas Enright was the eldest of ten children of a second marriage born on a small farm in Listowel Co. Kerry in 1889. Forced to emigrated, he found work with the Canadian Pacific Railway; ending up in Vancouver. With the outbreak of World War 1, he chose to enlist with the 29th Vancouver Battalion and fought with them at the battle of the Somme during September of 1916. Seriously wounded in trench combat on the morning of August 21st. 1917, during a Canadians attack on Hill 70, near Lens, north-east France; he was field hospitalised before being invalided back to Canada to spent the remainder of the war recovering from Tuberculosis (TB) in a sanatorium near Vancouver. It was here he met a nurse, Ms Mary White, a near neighbour of his from Bedford, Listowel, Co. Kerry. They were married the following year; both returning to Ireland in the summer (July) of 1919. January 1919: The first shots in the war of the War of Independence had been fired in Soloheadbeg, placing Co. Tipperary under martial law. In April 1920, Thomas Enright, now back home here in Ireland, decided to join the RIC force, and was sent to Thurles. On August 6th 1920 he resigned from the RIC and was absorbed into the Auxiliary Division of the Royal Irish Constabulary, (ADRIC), becoming a Barracks Defence sergeant. (Service No. 147). (now Liberty Square South), when they found the owner in bed. [Premises known as Jackie Griffins News Agency shop, recently eradicated to build a new car park entrance, by Tipperary Co. Council]. He was ordered out in his night attire and when he reached the head of the stairs he was tripped and thrown downstairs by an R.I.C. man named Jackson. In the fall, Hickey’s neck was broken and he was in great pain at the foot of the stairs when Sergeant Thomas Enright, who was in charge of the raiders, shot him dead, to put an end to his agony. Hickey was a well-known republican in Thurles, and a detailed account of his shooting was given to me during the truce period by Sergeant Enright himself. 1921 May. [Witness Statement 1454]. The Thurles R.I.C. tried out a new deception; in the hope of being able to inflict damaging losses on the I.R.A. Parties or police, attired in I.R.A. fashion and numbering about 20 men, went at night time, on foot, into the districts of Horse & Jockey, Littleton and Moycarkey. These parties were always led by the notorious Sgt. Enright, a North Kerry man and an ex-Canadian soldier. His accent did not require a great deal of changing to make it rather similar to that of the Tipperary people. A favourite dodge of his was to knock at a house owned by people of republican sympathies and pretend to the owner or his family that it was “Leahy and the boys” who were outside and that they were looking for some “wanted” I.R.A. men. These tricks never worked, as the civilian population was too wary to disclose anything they knew until they were very sure of those to whom they were speaking. After about four abortive attempts the police got wise to themselves and abandoned the idea entirely. Sergeant Enright then figured in another form of activity. About once or twice a week he led about a dozen policemen on patrol from Thurles into the country, varying the itinerary each time. Mick Small made an effort to engage this patrol on the Mall road, half a mile from the town. With a force of 25 men he waited there for about five hours but without result, as the patrol did not come out, In or about the same fortnight two more efforts made by Small to engage the police were also unsuccessful. November 21st 1921. In the aftermath of Bloody Sunday, November 21st 1921, the British authorities arrested hundreds of republicans and opened several internment camps throughout Ireland. The first internment camp was at Ballykinlar, in Co. Down, where 2,000 men were interned. Additional camps had to be established at Gormanstown, Co. Dublin, on Bere Island and Spike Island, in Co. Cork, and at the Curragh, in Co. Kildare. Some three days after the signing of the Anglo-Irish Treaty, on December 9th 1921, all republican prisoners were released from Ballykinlar. 1921 Dec 9th. A train carrying IRA men home from internment under the truce was attacked near Thurles. Certainly, the IRA believed Sgt. Enright was the man responsible. December 10th 1921. According to a report in the TIMES newspaper carried on December 10th 1921; Three of the ex-prisoners were wounded, one Deelan Horton of Ardnaree, Co. Waterford dangerously, (Horton later died). Another man, James Coleman was wounded in the head, and other people in the station including the stationmaster, his wife,and his sister-in-law were slightly wounded by splinters. The bombs were thrown under cover of fog signals, which were being exploded as a greeting to the returning men. December 10th, 1921 [Witness Statement 952]. The camp went on until our release which was on the 10th December, 1921. Our trains were attacked by hooligans with stones. One train was fired on. 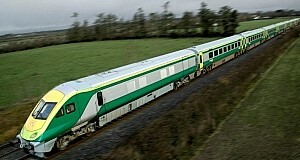 The train on which I was travelling stopped at Thurles. An R.I.C. man named Enright threw a bomb at the carriage next to mine, mortally wounding a Cork Volunteer. A truce was declared in July 1921 and a treaty agreed on the 6th December. It was mid-December 1921, with the Truce now fully in operation, when Sergeant Thomas Enright decided to attend a coursing meeting in the town of Kilmallock with his dogs. One of the dogs was ‘Bedford Lass’, entered under the name of his brother-in-law, Mr Patrick White. By pure coincidence, latter dog was drawn against ‘Political Duchess’, same owned by Mr Shawn Forde (also known as Thomas Malone), a well-known East Limerick IRA leader. The dog ‘Political Duchess’ won out to ‘Bedford Lass’ leaving a disappointed Sergeant Enright and his colleague, Constable Edward Timoney (latter a native of Tyrone), to return to Clery’s hotel that night to learn of the next day’s draw. Among the attendance at that coursing meeting on that fateful Wednesday, was Mr Maurice Meade (1893- 1972), then a 28-year-old from Elton, Co. Limerick, (just 3.4 km (2.11mls) from Knocklong, Co. Limerick). Mr Meade had served with the British Army in World War I, and then with Casement’s Brigade in Germany, before becoming a member of the Irish Republican Army’s (IRA) East Limerick Flying Column, latter commanded by Donnchadh O’Hannigan. Latter had played an active role in the raid on Kilmallock Barracks (May 1920) and were involved in the ambush at Dromkeen (February 1921). In “The Memoirs of Maurice Meade: A Forgotten Freedom Fighter”, an incident is recalled. 1921 December 12th. Meade shot at two RIC men at Kilmallock, Co Limerick. Sergeant Enright was killed and Constable Timoney was wounded in the shooting. The two policemen were in plain clothes and had left a hotel in Killmallock at 10.30. A group of men standing in the street fired a number of shots at them as they came out of the hotel. Without going into much detail, Maurice Meade himself claimed that he was among the group that shot Sgt. Enright and Constable Timoney that night. “Sean Fitzpatrick and I went to Thurles to investigate the matter. Our information was that the bomb had been thrown by a Sergeant Enright of the R.I.C. and that it had been thrown from the bridge over the railway near Thurles Station. [Kilmallock, Thursday] A startling tragedy took place at Kilmallock last night, when Sergeant Enright, R.I.C. Thurles, was shot dead and a constable named Timoney seriously wounded. Only meagre particulars are available, but it appears that the Sergeant and Constable travelled to Kilmallock on Tuesday night to attend the coursing. The Sergeant and Constable travelled in plain clothes together with another man who had charge of dogs. The latter returned to Thurles last night with the dogs. The Sergeant and Constable proceeded to Cleary’s Hotel, where the card was being called over for today’s event. After leaving the hotel, shortly after 10.30pm, they were fired at from behind, by a party of eight or nine civilians, near the Post Office. The Sergeant was shot dead and the Constable seriously wounded. The report of the firing created considerable alarm in the town. The then Cabinet of the Dáil and the Chief Liaison Officer of the IRA both condemned the killing, the latter stating, according to Saturday’s Irish Times, that ‘such deeds are not the acts of members of the I.R.A., but are the acts of cowardly individuals who endeavour to cloak their misdeeds in such a manner that they may be interpreted as the actions of soldiers of the Republican Army’. Sergeant Thomas Enright’s inquest details can be found HERE. Sergeant Thomas Enright was one of the last casualties of the War of Independence. His body was taken from Limerick; back to Listowel Co. Kerry, for burial on Friday 16th, the same day as the Westminster Parliament voted to accept the terms of the Treaty, before being finally accepted by our own government on the January 7th 1922. Those who shot him were not to know, or indeed those who would go on to report his death in the days ahead, that Sergeant Thomas Enright carried a tattoo on his right arm. The tattoo read “Erin go Bragh”, the Anglicisation of an Irish language phrase, “Éirinn go Brách”; which translated literally into English means, “Ireland until Eternity”. Forgotten rural Ireland remains a little more forgotten this evening, as trains servicing the south-east are cancelled. We understand that the rail services from Dublin will travel only as far as Portlaoise, due, once again, to a recurring power failure. We are told that a bus service will be provided to ensure rail customers reach their destination. However commuters have previously found that this alternative bus service was not sufficient to accommodate all Irish Rail passengers and commuters in the past have been forced to wait for some 40 minutes for other buses to turn up. Somewhat irate Irish rail representatives this evening at Portlaoise Railway station, have confirmed to passengers that they cannot be sure when their service will be back to normal or if trains will be allowed to return to Dublin either tonight or indeed early tomorrow morning. Access to most OPW-managed heritage sites will remain free to visit on the first Wednesday of every month, again this year. Families looking for a cheap day out in areas around Ireland, now have no excuse to remain caged up at home, over the coming weekends, for the duration of the upcoming holiday season. So if you want to visit the towns of Thurles, Cashel, Cahir, Clonmel, Roscrea, Nenagh, or even further afield, with your family, now is your chance at very reasonable cost for your outing. Do remember that Tickets are allocated on a first-come, first-served basis, and visitors are advised to arrive early to avoid delays at some of the busier sites. Visit heritageireland.ie for more information. What has Thurles Railway Station, Co. Tipperary and the English Houses of Parliament got in common? Mr Sancton Wood (1815–1886) was an English architect, born in the London Borough of Hackney. He was the son of Mr John and Mrs Harriet (née Russell) Wood, his mother being a niece of the painter and antiquarian draughtsman, Mr Richard Smirke, (1778–1815). Back in 1845, the first year of the Great Famine here in Ireland, Mr Sancton Wood won a competition for the designing of Kingsbridge StationA. in Dublin (Built 1846). The competition, commissioned by the Great Southern & Western Railway Company, saw Wood’s designs selected unanimously by the railway company’s London Committee, despite the fact that the Dublin Committee had favoured the design of an Irish architect, Mr John Skipton Mulvany, latter a founder member of the Royal Hibernian Academy of Art, situated in our capital city of Dublin. A. Note: Kingsbridge Station in Dublin of course is today called Heuston Station, renamed in honour of Seán Heuston, an executed leader of the 1916 Easter Rising, who had worked in the offices of Kingsbridge Station. In that same year Mr Sancton Wood was appointed as architect to the Great Southern & Western Railway Company; designing all the railway station buildings between Monasterevin, Co. Kildare (including Thurles Railway Station) and Limerick Junction inc..
All of these station houses, with the exception of Limerick Junction station, are designed in a gabled picturesque Gothic style. Mr Wood also later became an architect to the Irish South Eastern Railway Company, which developed their railway line between Carlow and Kilkenny from 1848-1850. Six years later Mr Woods work, with reference to Ireland, appears to have ceased altogether. Top Pic. : Thurles in 1846, before the introduction of the Railway in 1847/48. Middle Pic. : Back entrance view of Thurles railway station. Bottom Pic. : Front entrance of Thurles railway station. Having developed a taste for drawing, Sancton Wood’s mother arranged to have him admitted to the office of his cousin, Sir Robert Smirke, RA. (Royal Academy), latter then an artist and leading London architect. From here he was transferred to Mr. Sydney Smirke, R.A., who succeeded to his brother’s practice. He remained with Mr Sydney Smirke for several years, working on the drawings of important works; which included sketches of the designs for the rebuilding of the Houses of Parliament, which Sir Robert Smirke had already prepared for Sir Robert Peel’sB. the Prime Minister of the then English Conservative Party government,(1834–35), following a fire on October 16th, 1834. It was Prime Minister Sir Robert Peel who first imported, secretly, maize into Ireland for the first time, which due to the lack of knowledge on how to properly cook it; same became known as “Peel’s brimstone”. His attempt to breech a ‘Laissez-faire (or ‘Let Do’) system of economics in Ireland, saw him loose out to Lord John Russell as Whig Party Prime Minister in 1846. Following this Houses of Parliament fireC. the immediate priority for the British government, was to provide accommodation for the next Parliament, and so the ‘Painted Chamber’ (Latter the medieval Palace of Westminster), and the ‘White Chamber’ (Latter the meeting place of the House of Lords from 1801), were both hastily re-roofed and repaired for temporary use by the Houses of Lords and Commons respectively, under the direction of the only remaining architect of the Office of Works, the said same Sir Robert Smirke. C. Yet, one other famous artist, William Turner RA. [Joseph Mallord William Turner (1775-1851)], had watched the burning of the House of Lords and Commons in 1834, before painting several canvasses depicting the scene. Sir Robert Smirke’s temporary repairs to House of Lords and Commons were demolished in 1851, with the House of Commons deciding in favour of an open competition for the proposed rebuild. Alas, Sir Charles Barry conceived the eventual winning design for the New Houses of Parliament; the construction of which he continued to supervise until his own death in 1860. Mr Sancton Wood died at his home in Putney Hill, in south-west London, England SW, on April 18th 1886, and is buried in Putney Cemetery. 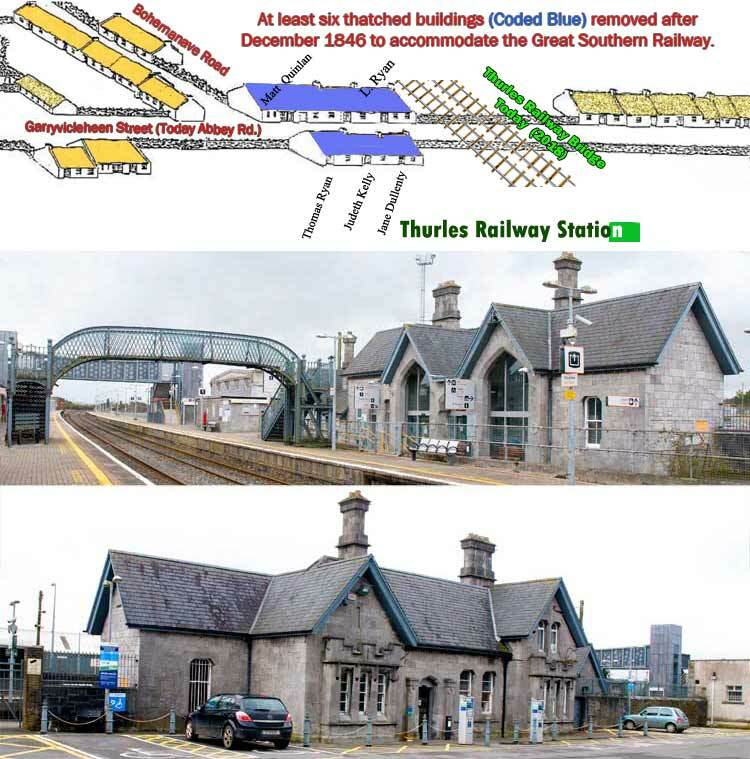 Today, Thurles Railway Station, which officially opened on March 13th 1848, boasts two through platforms and one terminating platform and remains a major stopping stage on the Dublin-Cork railway line, with numerous trains running hourly in both directions daily. Three times winner of the Irish Rail Best Intercity Station prize, it was also from here that on August 5th 1848 William Smith O’Brien was arrested, following his unsuccessful insurrection in Ballingarry, South Tipperary, known by the British disparagingly as the “Battle of the Widow McCormack Cabbage Patch”. Thurles commuters, who can still afford to use Irish Rail’s Saturday services; delivering its passengers both to and from Heuston station (formerly Kingsbridge Station); are being warned to expect disruption over the coming summer months. Engineering works are set to get under way between Hazelhatch and Thurles on the Dublin/Cork line, and Irish Rail are asking passengers to check Saturday train times very carefully, before using their service. Works however will not take place during the month of August or on any Saturdays concurring with major sports fixtures or concert events. Cork, Limerick and Tralee (on May 13, May 20, June 3, June 10 & July 1). 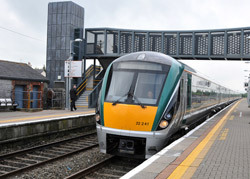 Dublin Heuston/Limerick services will operate every hour, connecting to/from all Heuston/Cork services, at Limerick Junction. The 17:05 Dublin Heuston/Cork service will be cancelled; with commuters heading for Tralee being asked to board the 17:05 Heuston/Cork service to change at Mallow. Irish Rail further confirm that there will be no first-class carriages on the affected Saturdays, and they intend to either offer a new ticket or a refund to persons who have already booked a ticket for a train, and whose departure time has been either changed or cancelled.